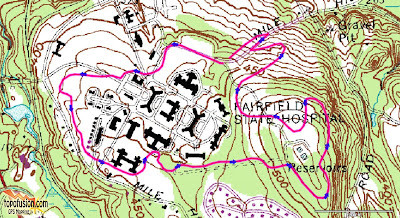 Met up with some friends whom I know through mountain biking and rather than trying to ride in the snow we went Cross Country Skiing at Newtown's Fairfield Hills Campus, which happens to be a former mental hospital that the Town took over after it's closure. There were some tracks already made that we used and we busted some of our own. The Green Trail up by the water tanks was awesome because quite a few people had already been through there. We met at the cul-de-sac at the end of Cochran St took off skiing through all the fields counter clockwise with the intention of heading up towards the water tanks. Since the Town Trail was plowed we skied through the woods on both sides of the trail and actually found an old trail that paralleled the town trail near the top of the hill. 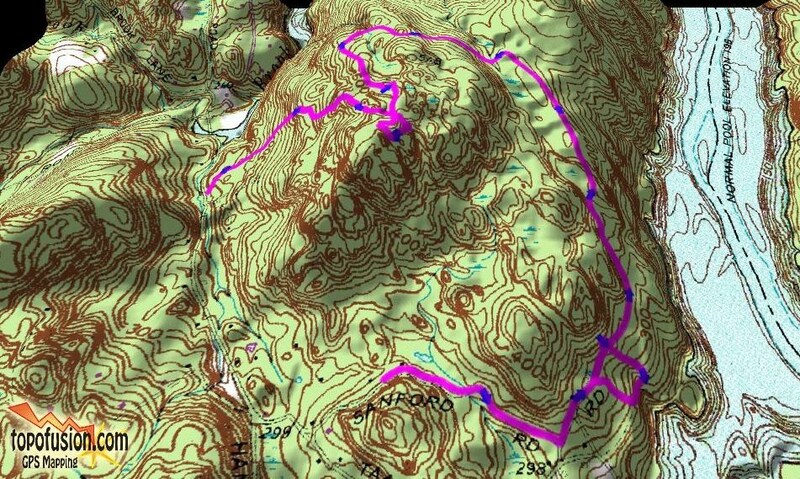 There is a trail marked with Green Blazes that goes to the end of the ridge and then circles back. I think this trail is a horse trail or used by horses. It comes back to the water tanks and then it appears to fork and head down the hill towards Wasserman Way. There were three different markings on this trail including more green blazes spray paint blazes, orange engineer tape, and reflector tabs (but not enough for mountain biking at night if that is what you are thinking). We followed this trail till we hit the fields and then headed back up towards the tanks. Getting back to the car the first thing I checked was my GPS to see how far we had gone but found that it had turned off. I was pissed! I knew I should have brought my Garmin Edge. I am going to have to go back and redo what we skied with the Garmin to see how far it is. Also, the next time we get a big dumping of snow, I am definitely coming back here to cross country ski! Here is the approximate route we took. I used MapMyRide to map it out. There are, however, two road crossings and you also have to cross over the paved trail heading up to the water tanks. In order to minimize the road crossings it will cut out some of the big fields that are fun to ski through. 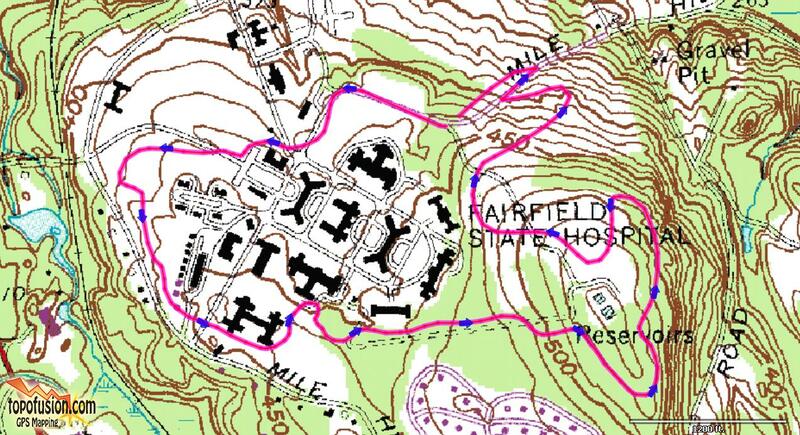 I hope, at some point in the future to create a marked XC Ski course here. After the pounding we took here in Western Connecticut earlier this week my riding plans for the week that I have off were literally blown away. However, a buddy of mine who lives in Eastern Connecticut offered to sell me his Velocity Blunts so I drove to Old Lyme to pick up the new wheelset and to try the front wheel out. Turns out the eastern part of Connecticut got much less snow than we did in the western part of the state and seeing that this is probably my last opportunity to ride in 2010 I was pedal to the metal! What I didn't expect was how close the color of the rim would match the Dillinger. Snow depths ranged from three to six inches of snow, some places were deeper due to drifting, but what made riding the hardest was transitioning between where people walked and the loose powder. Still, it was a lot of fun and a great workout. Thom and I met another mountain biker out on the trails, John W., but he was having a hard time pedaling and was walking more than riding. This was also the first time riding with my new HD video camera, the Drift Inovation's HD 170. I shot some ski vids the other day with it but I was out of power on Monday and couldn't edit any. The files, however, are huge! Above is an edited (shortened) clip that I loaded to YouTube. It turns this unit takes DVD quality videos at a resolution of 1280 x 720, and that's just the medium setting! The data file has a lot of overhead data in it, like stereo sound, and it's uncompressed, that I found from talking to Thom, if it were compressed it would be a much smaller file. The other thing I need to ensure is that my helmet is on my head really tight. We started riding around 3:45 pm and as you can see the sun was starting to go down but there was plenty of light for riding. Still, it was really cold with the wind. 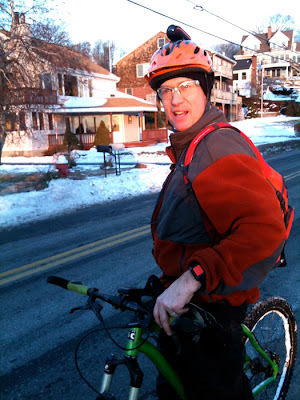 Initially, I was going to ride with my CT NEMBA Trail Ambassador Jacket, however, the wind was so strong I felt that wasn't going to keep my warm enough, so opted for a polar fleece North Face jacket that also acts as a zip in for another jacket. I got pretty hot in the jacket but was able to vent most of the heat through a combination of zip pits and the main zipper. I also had on Bib tights, and over pants. That was a bit of overkill but combined with my lobsters, skull cap, and winter riding booties I never got cold. Here is a slightly shorter clip of riding down the ridge towards the Pavilion at Rocky Neck State Park. It's a really cool descent there are many rollers and rocks to roll and huck. Of course I took it easy because of the conditions but looking forward to coming back here again when all the snow is gone. We rode the board walk along the beach over to Giant's Neck where I will be renting a house this summer with my family. Looks like I will be hitting Rocky Neck every morning and then doing the bike trails with my boys and daughter in the afternoons, besides lounging on the beach and building sand castles. We tried to find the house that I will be renting but had the wrong address. Thom took this picture of me and you can see the camera atop my helmet. I originally tried mounting it on the side of the helmet but it was too heavy. Whereas with my skiing helmet, the fit is more snug and I barely noticed it there. On the Mountain Bike helmet, however, it doesn't fit as snug and I could feel it pulling to one side. For these kinds of conditions, the Qball would have been perfect but it's still in the process of getting rebuilt. The Dillinger performed beautifully in the snow. Climbed just about everything and got a tremendously good workout! 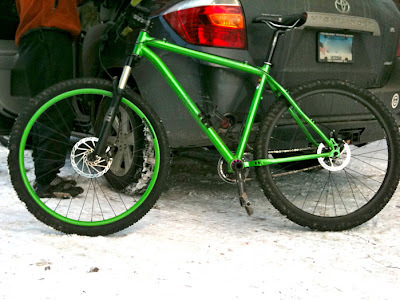 Of course the snow softened a lot of the trail and the new wheel performed beautifully. I might have to consider some Orange Blunts for the Qball. 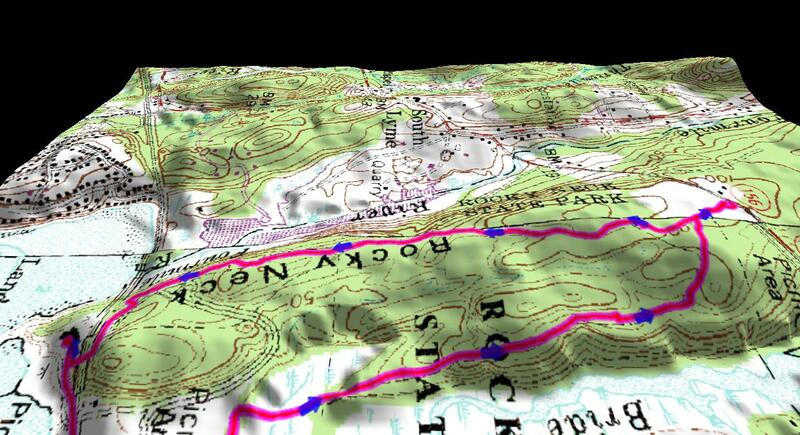 Below is a little 3D map of the single track riding area of Rocky Neck. It's not a huge place but according to Thom there are many more trails in there to ride. I am going to try to get back here in the spring to try them all and to familiarize myself with the area better so that when I am spending my week here, I know exactly where to find the goods. Any chance I get to go to NYC, it's always an adventure for me to see what kind of cornucopia of bikes I will see because it's a much easier form of transportation and the adaptations to bikes, especially those used by delivery people tend to be extremely interesting. While visiting relatives this past Sunday on the Upper West Side, which is extremely residential, the selection of bikes were mostly family oriented. After brunch we took the kids over to the River Run Playground at the end of 83rd Street and while the kids were running a muck I took the opportunity to snap a few pix of this interesting, rattle canned City bike with a Ghetto cockpit. Of course, the owner looked at me taking pictures of his bike as some kind of kook but while our kids ended up playing together I got a chance to chat and put him at ease that I wasn't planning on steeling his bike. Our conversation was more about the kid trailer and that he rides his kid to school, uses it for grocery shopping and general exercise. Clearly, it's an older model, steel lugged bike, rattle can black, to make it less enticing to a would be bicycle thief but with a Shimano 105 group. What struck me as interesting however was the cockpit. Flop and chops with Cross levers instead of aero levers. Side mounted Cateye - why not mounted correctly? I don't see why it couldn't be mounted correctly in combination with the aero extension bars, in fact given arm positioning the Cateye in that position would only serve as an alternative to an arm rest. Nice Soma saddle. A very interesting cockpit adaptation that I will remember for my next Old Crappy Ten Speed Conversion project, which by the way reminds me, I haven't done one in over a year now. I have quite a few frames to play with, too.